$327M later SanDisk has an enterprise SSD division. And a rather successful one at that. After careful consideration, SanDisk went for the low hanging fruit where there was bang for the buck. A commendable approach. On 16 May, SanDisk announced its intention to acquire Pliant Technology. On 25 May the acquisition was completed. The fit between the two companies looks good. The market opportunities are remarkable. Product synergies should abound. For better or worse, we won’t get telling results until next year, when the first joint products arrive. SanDisk has the NAND, chip-level and system-level expertise. Pliant had the enterprise SSD expertise, the controller, and the enterprise customers. Little if no overlap between the two. SanDisk’s SSD scorecard to date is decidedly mixed. For the PC market SanDisk is late. Fortunately that market hasn’t really taken off yet. The good SSD news is the modular or small form factor SSD market, where SanDisk seems to be racking up the design wins. 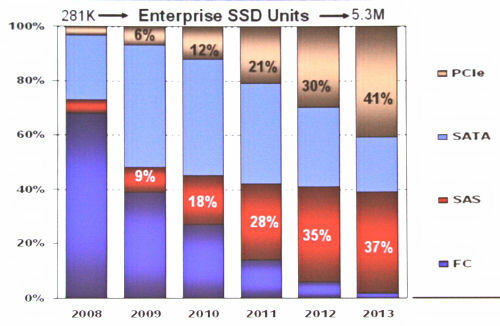 The enterprise SSD market has been a big zero for SanDisk. SanDisk has expressed interest, but delivered nothing. The Pliant acquisition gives SanDisk instant enterprise SSD credibility. Pliant has customers, design wins, and rapidly increasing revenues. Morgan Stanley believes that Pliant SSDs have been qualified at key storage OEMs including LSI, Teradata, Hewlett-Packard, and Dell. In March of this year, LSI sold it’s Engenio storage business to NetApp. This likely means that the Pliant business moved as well, both to NetApp and NetApp-partner IBM. Reportedly Pliant also sells to EMC. There was a whisper a while back that EMC was an investor in Pliant. Take that for what you may. Morgan Stanley believes Pliant’s sales will have tripled at the end of this year to around $100 million when compared to 2010. Pliant was facing a cash crunch. Although it had raised $57 million in funding, it needed more capital to fuel growth. Pliant also faced challenges in securing dependable NAND supply. According to Pliant, it first approached SanDisk about a strategic relationship regarding SanDisk’s NAND. Pliant also faced the ongoing challenge of having to support and qualify NAND sourced from different suppliers. No problem now. The Pliant team will know exactly what’s coming down the pipeline and will be able to design accordingly. Guaranteed NAND supply is secured. How important this inside track will be remains to be seen, but given the increasing design complexities as NAND moves to ever smaller geometries, and the uncertainties at play in securing NAND, this competitive advantage shouldn’t be underestimated. SanDisk’s acquisition of Pliant might be the first, but given the market opportunities, it won’t be the last. In 2010, the enterprise SSD market was somewhere around $900 million. In 2015, it is expected to exceed $4 billion. That’s a 4-5x increase in 5 years. And that’s not accounting for the related cloud-centric markets of thin form factor SSDs and Tablets, which are expected to grow every bit as quickly and emerge every bit as large. Some think that the emergence of cloud computing will mean less NAND used in devices such as tablets and thin form factor SSDs. Gartner doesn’t seem to agree. According to Gartner the PC SSD market is looking at a 3-4x increase in 5 years. Tablets are poised for even greater growth at 5x+ growth. 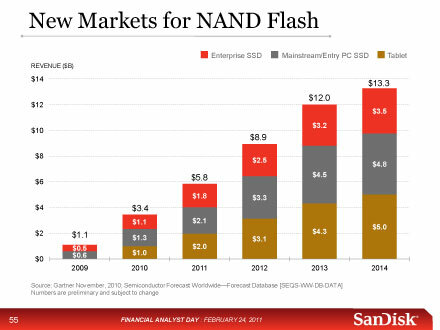 As the slide above indicates, in 2014, Gartner estimates the total for new markets for NAND flash – Enterprise SSD, PC SSD, and Tablets – will total $13.3B vs $3.4B in 2010. As SanDisk likes to put it, the enterprise is the first node on the cloud network. Here NAND is poised for explosive growth, because it enables server application acceleration and high performance input/output operations. The last nodes on the cloud network are connected devices such as tablets, smartphones and laptops. In these devices NAND is poised for explosive growth, because it enables smaller dimensions, lighter weight, lower power and faster response. For the last node, mobility trumps bulk storage. NAND trumps HDDs. Thanks to the Pliant acquisition, SanDisk now has high performance enterprise SSDs shipping to customers and it has next-generation products under development. Pliant’s products target the high performance enterprise SSD market. Today’s products, include both 2.5” and 3.5” SSD form factors and use a Serial Attached SCSI (SAS) interface. Products under development include PCIe Cards, a market pioneered by Fusion-io. Here is a link to a most informative 2010 article on the evolving enterprise SSD based on Gartner’s Forecasts. Pliant, as part of SanDisk, will no doubt continue development of both SAS and PCIe interfaces. The chart below graphically shows why. Both interfaces are expected to grow into dominant positions in the Enterprise SSD market by 2013. From 2010-2013 SAS is expected to grow from 18% of the market (by units) to 37%. For those same years, PCIe is expected to grow from 12% to 41%. The SAS interface is expected to grow nicely, at the expense of Fibre Channel (FC) drives, another legacy HDD solution. The future looks likely to belong to faster interface standards that are not constrained by disk-centric assumptions that have been baked into standard HDD interfaces. PCIe is a good example of such an unconstrained interface. Although Pliant has developed both SLC and MLC SSDs, it made the strategic decision to move as quickly as possible to the growing trend of MLC within the enterprise, where MLC SSDs are gaining ground on SLC due to their affordability. In 2011 MLC-based SSDs are expected to comprise 62% of the 1.2m drive shipments and at least maintain this level for the foreseeable future. Pliant’s MLC expertise should be a nice complement to SanDisk’s MLC and TLC expertise. One of the big attractions of Pliant was that it has designed and developed its own high performance SSD controller. As SanDisk apparently hasn’t been able to develop a controller suitable for the enterprise, without the Pliant acquisition it would have had to use a third party controller- if it wanted to pursue the enterprise SSD market. Without Pliant, SanDisk would have likely become just another SandForce-inside player. Far better to control one’s own destiny, both from a cost perspective and as a means of differentiation within the SSD market. A whole lot hinges on how good the Pliant-developed controller is, or can be, when matched with SanDisk NAND. Today no Pliant products use SanDisk flash, but the two companies have been working to qualify SanDisk’s memory in Pliant’s products. According the Wall Street Journal, the first Pliant/SanDisk products should be introduced in the first half of 2012, given that qualification typically takes nine to twelve months. It will be interesting to see whether Pliant’s high performance controller expertise also finds its way back down into SanDisk’s PC SSD product line. This entry was posted on Sunday, June 12th, 2011 at 4:15 pm and is filed under Uncategorized. You can follow any responses to this entry through the RSS 2.0 feed. You can leave a response, or trackback from your own site. I don’t understand Needham’s comment about ushering “in a new era of direct flash player participation in the SSD market.” All of the flash vendors except for Hynix already participate in the SSD market. And from what I can gather, Intel’s only reason for making flash at this point is to produce SSDs. I agree with you. Thanks for pointing that out. The big deal is that SanDisk was the first flash player to acquire specifically for the enterprise space and specifically for high performance controller technology. Thanks, Savo. General economic/financial headwinds notwithstanding, the acquisition of Pilant helps fill a key gap in SanDisk’s product line and expertise. As you indicated, a big key will be how good Pilant’s controller expertise is and whether the vertical intergration can give SanDisk-Pilant a competitive edge in enterprise SSD performance in the next few years. Hopefully the impact on SanDisk will be as positive/strategic as the M-Systems acquisition was [what seems like many, many] years ago.. Yes msystems does seem a long time ago. Did you hear that Dov has a new stealth start-up? Also it was reported last month that he was selling Modu’s patents to Google for $4.8 million. In any case I’ve wondered for a long time why SanDisk didn’t take advantage of of msystem’s enterprise SSD expertise. As I recall they were early players along with STEC. FWIW, my guess is that msystems enterprise SSDs were SLC and SanDisk only wanted to go with MLC, and out of sheer stubbornness just let FLSH enterprise products wither on the vine. In any case its history now. It will be interesting to see how SanDisk/Pliant do. I find it encouraging that Pliant was already MLC focused. It will be interesting to see what impact SanDisk’s controller expertise can make when combined with Pliant’s. As you say the key is the controller. “On May 25, we announced the completion of our acquisition of Pliant Technology, a leader in enterprise-class SLC and MLC solid state drives. Pliant has now become SanDisk’s Enterprise Storage Solutions business, and we welcome the Pliant team to the SanDisk family. The integration of the 2 businesses is progressing well. Our Serial Attached SCSI or SAS, protocol-based SSDs using both SLC and MLC NAND flash have gained very good traction with enterprise customers. It appears SanDisk hasn’t wasted any time taking advantage of its Pliant acquisition. Hopefully they will leverage it even further combined with their in-house technology roadmap. Do you – or your readers – have any knowledge of these CAM chips from NEC that could be a threat to the NAND-based SSDs ? From what I gather, CAM is a variety of spintronics, a nanotechnology which utilizes spin rather than electron charge to store info. MRAM is based on spintronics. FWIW MRAM, FeRAM, and PCM are all periodically are nominated as potential NAND successors. The big problem for all of them is that they cost more than NAND to produce. And the existing infrastructure is NAND. And technologies which can leverage the existing infrastructure is where where the big bucks are being spent on R&D. Maybe someday one of these other technologies might emerge as a viable candidate for a unified memory that combines the best of DRAM and NAND- fast access combined with permanent storage. But that day is probably at least a decade off, likely more- for uses such as SSDs. It looks pretty clear that NAND as we know it is going to continue on track for the next few years: 1xnm should be here shortly and for SanDisk will be the workhorse next year. Next will come 1ynm in 2013. And just possibly 1z as a follow-on. Then when NAND hits it’s limit, my guess is we’ll see a 3D NAND which can leverage the existing NAND infrastructure and serve as a bridge to EUV and hopefully SanDisk’s 3D R/W resistive memory. My tentative plan for the next post is SanDisk’s Technology Roadmap which will focus on NAND. The following post will likely be on future technologies covering 3D NAND and 3D R/W scalable cross-point diode arrays.